Obviously you are familiar with President Obama's family history by now - how his mother was a white woman from Kansas and his father a black man from Kenya. My ancestry is pure Swedish, but my husband's mother is English and his late father was Palestinian. My mother-in-law has told stories of strange looks and bias - but this was in the 1950's and early 60's when they first were married. Things have changed a lot since that period in America, but not as smoothly or fully as you might wish. America, the land of immigrants, is naturally a place where mixture is almost common place. My husband and I have joked about our widely varying upbringings and cultural influences, but never has it been anything near a problem for us - nor has it been one for our friends or family. And never once have we encountered anything near to racial bias. But, then again, that is probably also due to the fact that my husband, in particular, does not appear any different to the common denominator - which is white. His father did not have that advantage, especially at a time in this country when mix race marriages (or relationships) were essentially frowned upon. But we live in a different place and a different country now. Multiracial Americans have become the fastest growing demographic group, wielding an impact on minority growth that challenges traditional notions of race. This according to a recent article online at MSNBC. The number of multiracial people rose 3.4 percent last year to about 5.2 million, according to the latest census estimates. First given the option in 2000, Americans who check more than one box for race on census surveys have jumped by 33 percent and now make up 5 percent of the minority population — with millions more believed to be uncounted. This is not a matter of just black and white either. Every day more and more 'subtle' connections are being made - just like my husband and I. 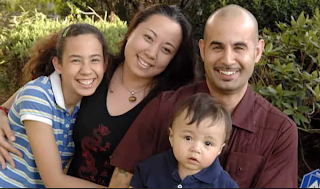 So, with the 'Global Parents' interview just posted the other day featuring a mixed race couple - the Ruhren family - I thought it might be interesting to share the story found on MSNBC. As part of the story there are interviews with 6 different couples front various parts of the USA. I'm sure you might find it interesting and familiar to your own, or your neighbor's, or a friend's story. It's not as surprising as it once was. Which is what I call progress... since LOVE has always been blind! The Nonchalantdad: Bring It ON. Six married men will be dropped by helicopter onto an island that is created to look like your average middle class neighborhood. They will share one car and 3 kids each for a full six weeks. Each of the 3 children will play 2 sports and take either a music or dance classes. As well, there will be no access to fast or frozen food. Each man must take care of his own 3 children. He’ll be required to keep his entire house spotlessly clean, help the children with all their homework, complete all special school projects, cook, do laundry, and pay a list of ‘pretend’ bills with barely enough money. In addition each man will have to budget in money for groceries each week, as well as surprise funds for the children’s needs..
Each man must remember the birthdays of all their friends and relatives. They will not be allowed to send email for these events and instead be required to write personal cards for each event. All cards will have to be sent out on time. Each man must also take each child to a doctor’s appointment, a dentist appointment, and a haircut appointment. He must also make one unscheduled and inconvenient visit per child to the urgent care center. He must make cookies or cupcakes from scratch for unforeseen social functions. Each man will be held responsible for decorating his own assigned house. He’ll have to plant flowers outside and keep the outside and inside presentable at all times. 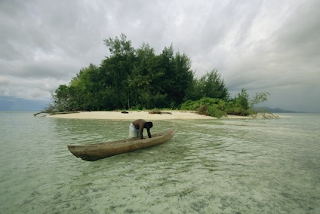 The men will only have access to television or email/internet after the kids are fed, bathed, dressed, and put to bed…. not including chores. It is important that each man must also fully shave his legs regularly, possibly wear makeup daily, dress in fashionable and attractive clothing, and put on uncomfortable but stylish shoes each time they step out of the house. Further, they need to have their hair presentable, fingernails polished, and eyebrows groomed. During one of the six weeks each man will be required to endure possibly severe abdominal cramps, back aches, major unexplained mood swings, but never once complain or slow down their domestic routines. They’ll have to attend weekly school meetings and possibly church or social functions – almost always with the kids in tow. At weekends especially, they will have to spend full days trying to find entertainment or driving the kids around. Each day and each night, almost without fail, they will have to feed the kids, dress them, brush their teeth, and comb their hair. They’ll be responsible for breakfast, lunch, and dinner. They will not be allowed to deliver the kids late to school, or child care. Each father might be required to also have one of the children be under the age of 2. As well, each father might have to hold down either a part time or full time job. At the end of the first few weeks the fathers will have to answer a test with questions that cover the following: birthdays, weights, heights, clothing/shoe sizes, doctor’s name, full details relating to each child’s birth, favorite snacks, drinks, toys, habits, fears, etc etc etc. At the end of 6 weeks the kids will decide who is voted off based on performance. The last man to win the contest will be the only one able to still perform intimately with his spouse at any moments notice. If the last man is able to win the contest, his reward will be to continue the role for the next 10 to 15 years!!! I love a pretty notebook. Here's one of those projects that time spent is nothing compared to satisfaction gained. 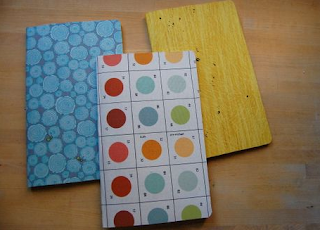 Less than 30 minutes, start to finish for a pack of 3 moleskine journal. Its great if you're like me and have the really pretty fabric and have absolutely nowhere to use it in a project at the moment (a large scrap would do one journal). 1. 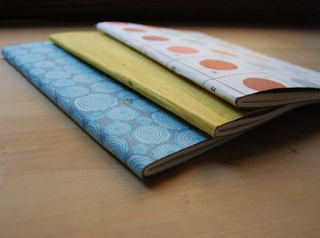 A pack of 3 Moleskine journals- I recommend getting the kraft brown covered ones, the other colors might show through the fabric. 2. 3 scraps of fabric you love (important!) measuring at least 11" x 9". 3. 1"-1 1/2" wide twill tape to add to the inside front or back cover to hold a pen (I was playing around with this as you can see in the first photo, but decided against it on my set). 6. GOOD music (this project barely requires thought). 1. 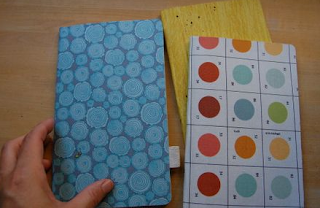 Cut a piece of the fusible webbing slightly larger than the size of your journal when opened and completely flat. 2. Iron the fusible webbing onto your scrap fabric's wrong side, following the package instructions. 3. When cooled, peel the paper backing off the webbing. 4. Center the journal on fabric's wrong side, making sure you have it centered within the area covered by the fusible webbing. Now close the journal, keeping the fabric folded around it. 5. With your iron, hold the journal in your hand, spine up, and carefully iron the spine area to gently adhere the fusible webbing there first. 6. Once you feel that's set, open the journal, cover facing up, and in small sections, begin adhere the fusible webbing to the journal cover. You will see it start to adhere. Be careful not to adhere the fabric to your ironing board! Allow to cool slightly. 7. Trim the fabric completely flush with the edges of the journal cover all around, then iron the corners and edges of your journal again to be sure all are fused together. We are looking far and wide to try and find parents willing to share their story for the benefit of other parents. We have asked you to suggest to us willing participants so that we might get an insight into how many different ways there are to raise children. As well, we think it can always be useful and interesting to see how other parents habits and rituals might shed light or enable your own. So, with that in mind, we recently received an email from Suna Ruhren in Upstate New York asking us if we'd be interested in featuring her husband and her for the 'Global Parents' Blog, particularly because we have yet to feature a 'mixed ethnicity' couple. So, naturally, we obliged. Suna, where do you and your husband live? We have lived in Albany, New York for over 2 years now. My wonderful husband was born in New Jersey and is a 3rd generation American of German/Swiss/French descent. I was born and raised in Japan, my childhood spent on the pennisula of Chiba. I came to the USA to study and we met while I was doing grad school in NYC. After our son, Max, was born we moved to upstate New York because it was nearer my husband's family. Albany isn't much more than a few hours drive outside of NYC, but it is like a different world. Our boy is zooming towards 3 faster than we could have imagined! 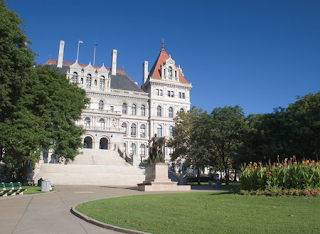 What's it like raising your son in Albany? I have to say that, compared to the big city, it is a little more homogenous and somewhat ethnically separated here. People aren't always accustomed to our arrangment as they might be in NYC, and so they can jump to stereotypes much more quickly. Our son has wavy blond hair and only slightly Asian features and when people see him with me they often make the assumption that I am the nanny! I guess it is easy for them to think this when they see something that is visually contradictory - I guess it's a neat and tidy answer. It seems to be a bit of a rude assumption, no? What shocks me more is that when they see white parents with Asian children, which I have seen many here, they definitely do not make that assumption. That equation simply adds up to "oh how cute, that caring (or unfortunately infertile) couple adopted an adorable Asian child." If you see a white child with a woman of some other race, then she must be the nanny. I often think about how our son will feel growing up in a multi race family and whether he will have issues about fitting in. So, you have your own business, right? Yes, I started my children's fashion business Hummingbaby Inc. after I had my son and our subsequent move upstate. I had always worked in fashion(womens wear) but I knew my passion had always been in tiny baby clothing. I saw a tremendous niche in the kids market in the U.S. for quality fabrics and great design (aka super cute) so I design Humminbaby's line out of 100% gauze fabrics for ultimate comfort. Well, tell us about your average morning ritual, will you? I am a bit embaressed to admit, but my husband often wakes up with our son while I sleep... except when he works a morning shift, they will get up and go feed the cats together. This is a little trick he came up with to get Max up and out of the bedroom and engaged in things so Mommy can sleep a bit more. I tend to work late into the night and never was a morning person. After the cats are fed he feeds him a banana and a cup of milk. Then depending on our days plan and my husbands ever changing work schedule he either gives him a bowl of cereal, makes pancakes or french toast when it is time for me to rise or they get me up and out to our favorite bagel place. 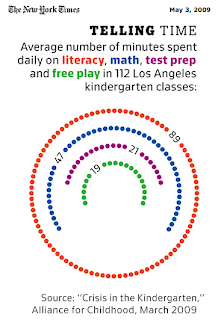 We almost always take Max out before lunch to the park playground and or the library depending on the weather. With your business and those late hours, it must be a bit difficult? Does Max attend any pre-school or anything of the sort? I am essentially a stay-at-home mom and Max is with me all day except when my husband is free as I mentioned above. We are thinking of enrolling him at pre-K when he turns 3 and are looking at the YMCA for swimming lessons and more kid interaction. We do not really believe in the idea of home schooling. With your differing cultural backgrounds, is there anything special on Max's menu on average? I have to admit... I am really bad but I can't stand when he cries... I simply give in too often. If he wants to eat peanut butter and jelly sandwiches for lunch then that's what he eats. My husband is much more strict than I am though. Our son knows he won't get away with things as easily with his dad. Kids are smart aren't they? Besides PB&J Max loves grilled cheese, yogurts, apples, grapes and baby carrots! I came from Japan so we also eat a lot of Japanese food. He loves miso soup, rice balls and tofu. We have miso soup everyday and no, we don't get tired of it if you are wondering! We eat edamame (soy beans), barley tea, and are trying to get him eat some fish. He used to eat it but has been resistant latey. Food is such an important part of our life together. Both my husband and I cook and search out new recipes and will travel to try new foods. We hope to make a noodle and dumpling trip around Japan if not the world. We especially love Japanese food and there is so much more than sushi. If you would like to try the full spectrum of everyday Japanese food, Harumi's Japanese Cooking Book is our favourite. This book is easy to follow for beginners and it often lists substitute ingredients you can get from local grocery stores. Anything special that Max likes to do? He loves music and dance -we dance together at home! We go for little walks exploring in the woods and in our neighbourhood we have met many people and their dogs. He likes story time and our library is great. Max watches videos, listens to music and has books in English and Japanese. In English Caillou has had the biggest impact on Max and how he talks and acts. We swear he learned to giggle from Caillou. My husband and I are "silent" laughers. The Japanese TV show "Mommy and me" really got him up singing and dancing. His latest favorite is Anpanman and we have just introduced the classic Dr. Seuss. I also have a group of Japanese moms who get together usually once a week so that is always something to look forward to. He gets to interact with other kids and go different places such as strawberry and apple picking and the farms. What about snack time - anything unusual? Nothing interesting here other then when he downs a dozens baby carrots, he loves them! I would also note how wonderful it was for Max to eat strawberries in the field, blackberries from the side of the trail in the woods on a hike and cherry tomatoes in the vegetable garden right off the plant. On our must recent trip home to Japan the family next door had a cherry tree which had been given to them from their grandmother and the little girls who Max played with gave us some cherries. Max is still young but my husband was touched and it recalled his childhood best friend who had a pear tree and although there were only two harvest during that friendship they were such important memories in his life. Food forms such nurishing memories. Max and Dad celebrate a birthday! Is Max napping during the day? Max has never been a great napper. He swings wildly from no nap to sleeping for hours on end. We are not the most structured people and probably have fostered this. And, evening meals? What's that like? Definitely Japanese food and Korean, a bit of Chinese. My husband is a great cook. I am so blessed! He also cooks Mexican, Indian, Italian among others and we try to get Max to try less seasoned elements from our meal but beyond different types of rice, several types of pasta and avocado he is pretty resistant at this point. Of course Mac & Cheese is a hit. How's the routine around bed time? We are bath people. Either my husband or I give our son his bath right before he goes to sleep. I think that it calms your body down and it makes it much easier to fall asleep. The most important would have to be spanking... I was spanked often. I don't think it will do any good to a child. However, I also don't believe that just "firmly speaking" to a child will make things better. You have to be much more creative than that and we are still working on it! It is a serious concern for my husband and I as Max pushes his limits and we both don't want to act like our parents. The flip side to that is being more warm and loving. We hope to make sure that Max knows how much we love him and that he is our "heart external" whom we will always love to hold cuddle and kiss, aching to pull him back inside although we know we must let him grow and pull away. And....we take a lot of pictures - maybe too many at times...!! Thank you Suna for sharing! Please let us know if you'd like to be considered for this segment, or if you know anyone who might be interesting or unique that we can pester! Thinking of that Special Gift? Well, I've seen it all now. 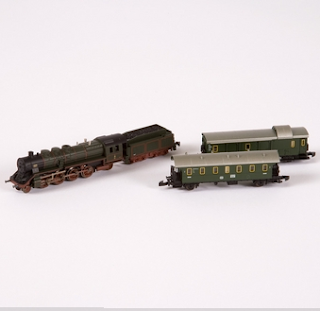 Perusing the website for Paul Smith - as you do - I came across this wonderful 'toy' for that .... well.... that particularly hard to please child - or childlike adult. Actually, if my children received this unique gift they would probably dismantle the whole thing in a matter of minutes - but it's nice to think that this could be something special if you had the budget. 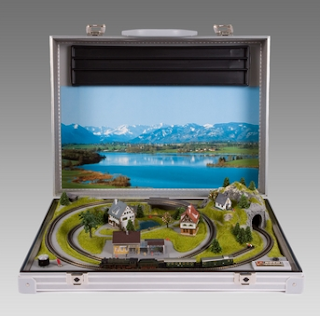 In fact, forget about getting it for the kids.... how about one of these for your next board ('bored') meeting? Thankfully, the site says there out of stock - so that saves the temptation to get it for my next Parent/Teacher conference! Anyway, as you can see, I'm still not quite back into the work mode just yet. Still avoiding the paperwork. Not to worry though, I'll get back up to speed shortly. Just feeling lazy in the meantime. We usually like to have lot's of things going on and we have become pretty good at juggling it all between my husband and myself (remember we don't have family members nearby -- they are in Minnesota and California!). But this last week was super nutty! and then at the last minute we decided to have some people over for a memorial day cookout, then we had a photoshoot for a local magazine Rhode Island Monthly on Tuesday, then today (wednesday) my husband had to ship out a crate of paintings for the Basel Art Fair in Switzerland... SO all this to tell you that this is why we didn't blog for what seems to me as ages... but we are back now, blogging and shipping orders (and OH in he midst of this my new collection came in--I'll blog about THAT later). My kids and I have made peg dolls for many years. 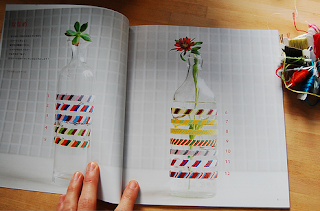 They are so easy and fun to personalize and a fun project to do together. Here's how we make them. 1.wooden clothespins or pegs (these are sold in any craft store, and there are several variations of them, we like the kind that can stand on their own. 7. pink fine tip marker (optional, for rosy cheeks). 1. Draw a face on the top of the peg with the black marker, add rosy cheeks if you'd like. 2. Let your child pick out their favorite fabric scraps, then wrap it around the body of the peg a couple of times, help them secure it with a length of yarn tied around the middle for a belt. 3. For the hair, wide yarn around 4 fingers a couple of times, secure in the middle with a length of matching yarn, then cut the loops at either end. Apply glue to the top of the peg, and glue the hair on. They are ready to play! These pegs are similar in size to our Playmobil people, and also work perfectly in our dollhouse. Here are some pictures of one reading her diary and another one painting and talking to her friend the elephant. We finally got some work done on the garden! so we realized a few things... for one it's too small!! this garden will feed us for about one week! Secondly, it looks as if the things I started from seeds outside are growing faster than the seeds I started inside?! maybe they will even out after a bit, but after one week it seems funny?? We used some amazing organic compost and it looks great! We will keep you posted and we are still excited! It's our first attempt and we have learned some things... so that's the best part! It's hard these days to keep track of all the evils that are out there but BPA is one of those things that most of us has heard about and if not I will just tell you that most plastic bottles are made with it (apparently it makes the plastic harder) and all canned goods are lined with it, if you want to learn more about it click here. But in March 2009 three states attorneys general (Connecticut, New Jersey and Delaware) asked the top six baby bottle makers to stop using it. So now, Avent, Disney first years, Dr. Brown, Evenflow, Gerber and Playtex will all stop using BPA in baby bottle manufacture. 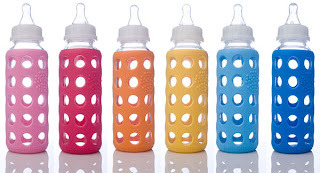 In the article that I found in the medlines website they go on to say "Legislators in Suffolk County, New York, unanimously voted last week to ban polycarbonate baby bottles and sippy cups marketed for children age 3 and under, making the county the first jurisdiction in the US to ban BPA products. Canada banned BPA-based baby bottles in April 2008, with the expectation that bans on all BPA-based products will follow soon." I think this is such good news and hopefully we will follow suit with Canada and not have to worry about BPA's anymore! Or you can just use these wonderfully colorful glass bottles from wee-go with a silicone sleeve that keeps them safe from breaking! I think I would go with this choice!! “Oh, right,” I said. On the day of the delivery, he and I were on different planets. During the final week of my pregnancy, one watch and then another stopped dead on my wrist. One twin lay so low in the chute I thought he might fly out when I sneezed. When I walked down Main Street, I struck fear in the hearts of loitering teenagers whose averted eyes said, Don’t have it here. A truck driver yelled from his window, “I hope it’s today.” I waved back. The watches didn’t concern me. Everything about me said imminence. In the O.R. they strapped my arms out akimbo and raised a curtain to spare me and my husband the view. Since I arrived at the hospital, dozens of black-and-blues had mysteriously appeared on my arms from blood tests taken weeks before. That, apparently, was because my platelets had plunged. Odd, I thought, where had they gone? As a result, it took my doctor three tries to find an anesthesiologist willing to give me an epidural. “Are the babies O.K. ?” I asked. “Looking fine,” the nurse said noncommittally. The anesthesiologist went to work, and the doctor systematically pricked my skin with a needle to test where the increased epidural was taking hold. His voice came through the blue curtain, asking me in the same flat tone, two or three dozen times, “Do you feel this?” to which I answered yes, no or a little. The anesthesiologist gazed down at me through milk-bottle glasses­. “Do you feel that?” The plastic oxygen shell over my nose made it difficult to answer. The doctor announced he was about to begin. Before I knew what was happening, my son’s cry hit the cool air of life. Then, my daughter’s piercing wail. A nurse brought my son over for me to glimpse, his face compressed in a roaring scream, and I wept, crushed by joy. At the same moment, an arc of pain sliced under my ribs. I could hardly breathe, and when I looked up into the anesthesiologist’s eyes, he said, “It’s just the doctor, repairing your uterus.” It felt as if I were being murdered from the inside out. The epidural, apparently, was spotty. In the recovery room, a nurse entered with new bags for the IV, Demerol for the pain, magnesium sulfate for the toxemia, which appeared unaccountably and raged during the last hours before birth. When I asked what toxemia was, the nurse said something about high blood pressure, blurred vision and swelling, which I hadn’t noticed until she mentioned it. My legs were like tree trunks, and from the look of my stomach, I was more pregnant than before. “But wait,” I told the nurse. “Just yesterday I was out hiking with the dog.” She gave me a sympathetic smile. That was the other life, the before. The babies were fine, my doctor said; the pediatrician would bring them to me shortly. I asked him when my swelling would go down. He said, in his usual style, never. I tried to laugh but instead cried. He said that all women cry, that my hormones were through the roof. But I knew I was crying because soon two infants would be wheeled into my room in need of my constant attention, and my body was a train wreck. 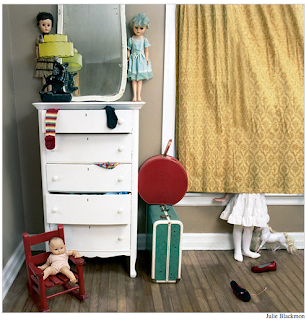 When at last they were brought in, I saw my daughter with her skinny legs and watchful eyes for the first time. “Small but feisty,” the nurse said, handing both to me. Their image blurred in my arms. Toxemic vision made my twins into quadruplets. For an instant, I worried that I might never see them clearly. At the same time, I was sure I had known them all my life, and even before that. I closed my eyes and held them, two distinct human beings who were not their mother, not my husband, not each other. My husband caressed my arm. He was speaking, but I could not register his words, only the spaces between them. People said time would accelerate with children, but at that moment I heard only the brush of tiny fingers against the sheet and the infinitesimal pause between the inhalation and exhalation of each whispery breath. Tess Callahan is the author of a novel, “April & Oliver,” which will be published next month. The Nonchalantdad: Holy Mary - breastfeeding in public! Having been an art student, I long ago passed any stage where the depiction (or actuality) of a naked body proves upsetting - unless it is mine....hmm. Anyway, because of this certain familiarity and because my mother was the kind of English nurse who thought nothing of bodily functions, I rarely give it any thought. 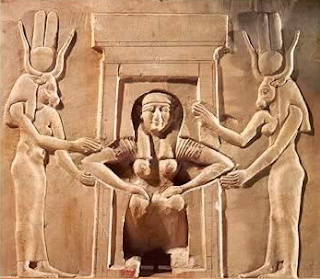 So, I find it rather amusing when others generally freak out over such things as breastfeeding - especially when I also happen to think it is one of the highest forms of humanity that one human can share with another. I happened to be in a cafe recently when a mother nearby happened to discreetly begin breastfeeding her little boy. Now, I'm not an advocate for public 'displays' necessarily - there is no point really in thrusting your own habit in front of others. But, that's why I point out that this woman happened to be discreet about it. After all, I was in London, and this is often the capital of discreet. Now, I wouldn't have probably even noticed myself if it wasn't for the young couple next to me scoffing at it. I looked over at their point of concern and then back at the couple. I had to laugh. It is amazing how female breasts can be surgically enlarged, reduced, lifted, and pierced, stuffed into "Wonder Bras," packaged, marketed and sold (or used to market and sell other things), but are rarely conceptualized in the Western world as being what they truly are: the means to feed babies. 1. We are long accustomed to sexual-izing the female breast and, as such, it makes us uncomfortable to see it being used in it's fundamental role. 2. We are generally prudes and the sight of it makes us feel... well, human .... strangely so. Well, it got me thinking. 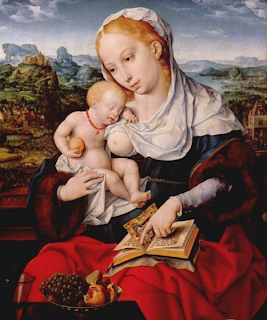 And, since I was heading across the street to the National Gallery of Art in Trafalgar Square I figured I'd have some extra amusement and see how many paintings I could locate that presented the Madonna breastfeeding the baby Jesus. It's not a hard game to play, especially if you're an art history nerd like I am. In fact, looking over the many paintings in the collection I was reminded of a story last year that suggested the Vatican was also having a bit of any eye-opening return to common sense. It appears that the Vatican was advocating that its previous censorship of such imagery was a bit wrongheaded and that instead the very act of Mary feeding Jesus was indeed an affirmation of the glory of God. And, in my opinion, what's good enough for God is certainly OK with me! 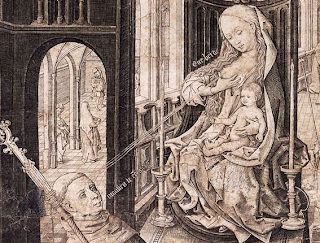 I'm sharing a few images I've found with you, but there's a longer history than you might imagine of the unabashed depiction of Mary breastfeeding (a few thousand years) Jesus - so to see more I suggest you head over to Fisheaters.com again and scroll down to see some of the many they have put on their list for your convenience. Some great names in art have depicted the scenario, such as da Vinci, Michelangelo, Raphael, Campin, Van Eyck, Rembrandt, etc etc..... So, it is my suggestion that next time you encounter a discreet mother only doing what comes natural with her baby, you should perhaps put the concept into perspective and just relax. After all, if it really is not your kind of thing, then just turn your head away.... and whatever you do, stay out of the National Gallery! But, be warned, if you do, you'll surely be missing some of the most beautiful pictures on earth. 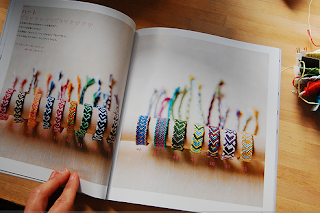 I kind of lost it when this book Misanga Promise Ring first came in the mail, a gift from my friend Jen. She had sent it to me after reading all my ramblings about friendship rings. 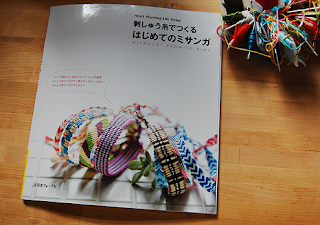 I'm not surprised that the Japanese can elevate the humble friendship bracelet to a work of art and the images in this book are beautiful. Deciphering the language is a different matter if you don't read Japanese - and it almost seems to make more sense when I don't read them over so many times! Nonetheless, I enjoy every minute of making these! 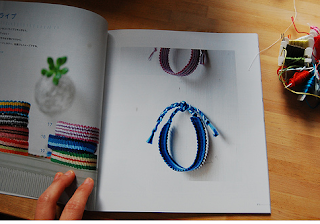 I really love any excuse to buy more DMC embroidery floss, its like cheap craft fun. Just pick out every single color you like and try spending over a few bucks. 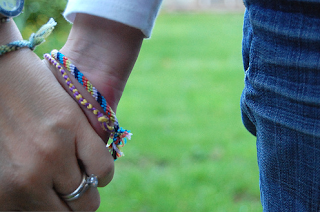 My daughter Emma and I usually get in a mood to weave friendship bracelets around this time of year. For some reason, nothing makes me happier than seeing a kid with an armful of friendship bracelets that have gone through numerous showers, baths, swimming pools, and hikes through the woods. This is truly one of those crafts that stay with you...meaning you learn how, clicking the rhythmic weaving action together in your brain, and it only takes a minute or so each spring to get back on board with remembering how. We use a safety pin to pin the end of it to the knees of our pant legs as we weave, but you can also use a clipboard. The challenge is to keep them on all summer, cutting them off only at summer's end. Let me know if you have any questions. News sometimes gets to us very slow. 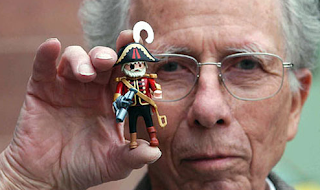 But in case you missed it a few months ago somebody instrumental in the children's toy world passed away. Hans Beck, the inventor (or 'The father of Playmobil' as he is called) of Playmobil, died at the age of 79 in his native Germany at the end of January. Once our children reached a slightly older age - or the age where they acquired the reasoning to cease from putting anything small in their little mouths - Playmobil became instrumental in their playroom imaginations. I'm sure most households now have at least one item of Playmobil. 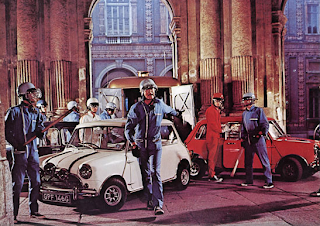 So, it isn't surprising that it took a few years for Mr Beck to develop the idea of Playmobil (I just love that name) - but it is surprising that he was originally trained as a cabinetmaker. His first venture into producing toys came when he approached a company called Geobra Brandstatter to make his model airplanes. Instead, he was asked to develop toy figures. Not initially recognised as viable by the owner of the company, Beck continued development. Apparently, it was the oil crisis of 1973 that prompted a closer look at manufacturing these little plastic environments. 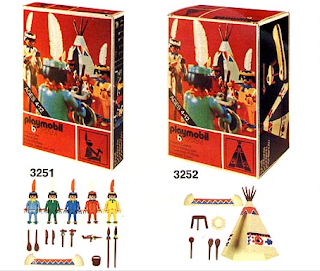 It is interesting to note that Geobra Brandstatter had been producing HoolaHoops and Large Plastic Dolls.The first series was basic, only including Native Americans ('Indians'), Knights, and Construction Worker sets, and was a bit slow to gain any traction. You can imagine why perhaps, since most children were accustomed to either tin figurines or rigid plastic ones or larger dolls at that time. 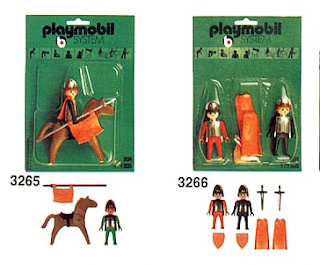 Playmobil figurines were designed to be fairly adaptable and changeable, incorporating all sorts of appendages and objects. Today, many enthusiasts have taken to cusomizing their own version of the figurines - which doesn't always result in the best of taste. But, it didn't take long for the idea to start 'snow-balling' and now today, some 4 decades later, you have a wide variety of scenarios and figures to choose from. There's almost a whole world of scenarios - Our household favorites are the castles and the airport/airplane. Funnily enough, Beck for some reason stated that Jumbo Jets, Space Aliens, and Dinosaurs should never be made. Of course, that isn't the case now. Another thing that has changed, you might have noticed, is that in the beginning it seems the boxes did not have the standard blue/white design they now have. The detailing seems also to have been more intent and the color coding relevant to each series: Knights=Green Packaging, Native Americans ('Indians')=Red, and the Construction Workers=Blue ..... hmmm, I wonder why? My only real complaint with Playmobil is that the many pieces, though fun to construct in the beginning with your son or daughter, gradually start to disappear. Our Airport Scenario has altered so many times to compensate for this fact that the Airport Terminal now resembles something out of a disaster zone with signage hanging off unintended 'walls' and a baggage claim area bereft of baggage, and a roofing system patched together of whatever odds and ends will attach! It's quite a sight. Nonetheless, the kids still love dragging it out and playing with it, much as Mr Beck suggested they would when he stated "... they invented little scenarios for them. They never grew tired of playing with them." And, for that, we should thank Hans Beck for being one of the first to start revolutionizing children's figurines and subsequently expanding in all directions the potential for imaginative play! We have added a new function to the Nonchalant Mom website to help you see more of each of the products and more images to help you make better decisions. I hope that this is helpful and I would be interested to hear from everyone on whether or not this is helpful! So here is how it works -- roll over the top bar of images and it will ask you to click anywhere to see a picture show, this will bring you to more images that you can click through as a slidehow or you can click on the image that you want to see closer. We are working on making Nonchalant Mom easier and more fun for you to visit and shop and well... make just looking around better! So if you have any ideas please let us know! I'm not really sure what to call this dish that we made but let's say Beet Stew. We have a friend that comes up to visit from New York quite a bit and he always brings beets! He loves them and luckily, I love them, but besides the normal beet recipes (and I will have to toss in there beet pasta which isn't so normal) we came up with this recipe last week. The recipe turned out so good! The kids loved it, we loved it... so I figured we should share it with you. I have to say that we were both just tossing things into the stew so I'm not really certain that this is the complete recipe, so if you make it please let us know what you think! The first night we served it with french bread, roasted garlic and brown rice on the side, but for the kids I just mixed it together, the second night we made it with polenta and that was super good too so there are many variations. either use an immersion blender or spoon some into a blender, but don't make it all a puree leave some chunks and you are done! If you are concerned about protein you could add tofu or have some cheese on the side, it would be delicious with sharp or hard cheese, or goat cheese. let us know how yours comes out!! lucky fish moon & stars t-shirt BACK IN STOCK! There were so many of you that loved this t-shirt and so we asked Jann to make it again and she did... just for us! So the Moon & Stars t-shirt is back in stock! available in sizes 2 - 10 year, I only have a couple in size 8 year and ONE in size 10 year so if you want them just write me an email or write in the comments section of your order to add this item (sorry for the extra work... I will have it online later this week if any are left). But you can order sizes 2-4-6 as normal online--click here! Thank you Jann for making some extra for us! -- we love MOON & STARS! I remember travelling to England with my mother. 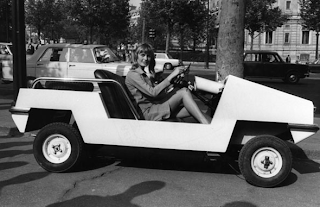 We were living near Los Angeles at the time and, of course, were used to moving around in cars that resembled small boats more than they did a car. It was the later 70's. A trip from California to England, with 3 out of 5 of her young children in tow, was not an easy thing for my mother in those days especially. By the time we arrived in London the next day, the kids were beyond tired, and my mother.... well, you can imagine where her mind was at. Anyway, I remember very clearly all 4 of us showing up at the car rental place, with tons of luggage in tow. Somehow, my mother - typically English - decided that it would be 'adorable' to rent a Mini during out stay. So, there we all were, sheepishly staring at this thing that resembled a lawn mower with a roof. To this day, I don't know how she did it. But, within about 20 minutes we piled all that luggage and ourselves in the car and off we went down the motorway. It was obviously memorable. I'm not sure you would think of doing the same thing with the kids now, but it certainly didn't hurt us then! I think that is the way with many things 'Mini'. 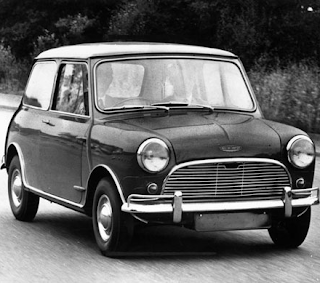 It is why, since 1959, the Mini has maintained a unique and surprisingly formidable presence in the auto world. 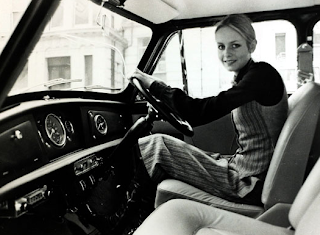 It is a simple car, what many consider a 'classless' car because of its ability to transcend the class system - both rich and poor have loved it, both sporty and practical, both stylish and miserly. It suited everyones needs. 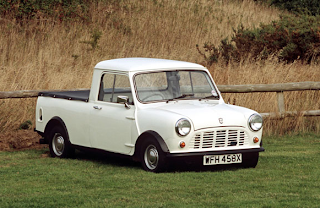 So, I was looking at a segment in the Guardian Newspaper and came across a series of photos of this classy little vehicle and just thought it would be nice to share. 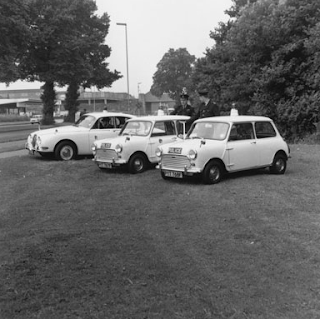 If you have any stories about your own Mini, or riding in one, that would be great. 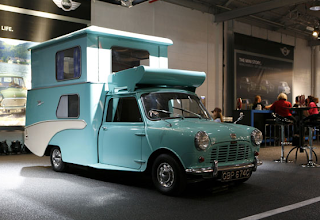 Moreso, if anyone out there has ever actually used the Camper Van version - I'd certainly love to hear how that worked out? Hello Mommy.... we snuck onto your blog to wish you a very HAPPY MOTHER'S DAY! We also wanted to say Happy Mother's Day to Nana and MorMor....!!! I love the separate snack bag attached over the handle in the pictures above. 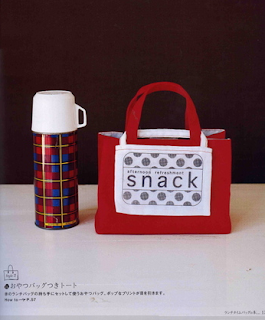 Doesn't everybody need a cute little bag to make lunch more exciting? I was originally thinking these would be fun to experiment with as handbags, but a lunch box might be fun too. I do try hard to make the "bag" lunches I pack my kids take to school as interesting as time allows. Some days this may mean something as simple as a note saying, "Feed your brain, eat your lunch! I love you." or maybe a surprise thermos of hot cocoa on an blustery day. I have made one of these with a detachable snack bag, using a plastic lining fabric to protect the inside (I would love to use greener alternatives for the next one). 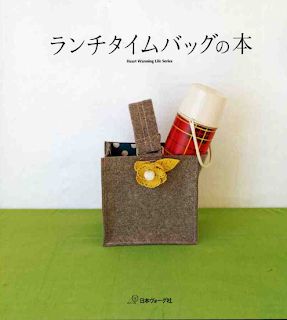 Its a favorite book of mine because it perfectly illustrates what the Japanese way of taking simple, every day things and making these so pretty and fun to own and carry, which I love. The idea of cloth versus plastic and less waste appeals to me, and I want to pass this on as a way of life to my kids. Pack one of these with some healthy food and a pretty cloth napkin to spread out on the table or on your lap and you have a lunch worth eating, no? This is a tote-style, small lunch box, lined inside with clear iron-on vinyl (be warned this takes a little practice to work with). 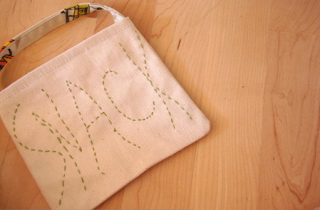 The snack bag is one of those pre-made small canvas craft bags that I bought, then replaced the handle to match the lunch box, its part of the same airplane curtain panel I've used before in other projects (I like it very much). 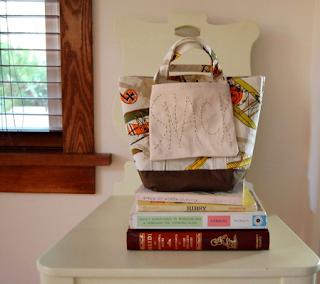 The idea is that the snack bag loops over one (or both) of the handles of the lunch bag. Slow Schooling: Can A Child's Development Be Sped Up? Forget about toilet training, or foregoing the sippy-cup, or ridding your child of a pacifier. There are many other concerns once your child starts walking and talking! Should a child be reading fluently by the age of 4 years? Should a kindergartener have homework? Will your 6 year old enter first grade, or be moved into 2nd? Should your 5 year old be able to consider fairly complex mathematics, let alone spell their own name? And what about tests for the youngest grades? Better yet, will any of it really matter in the long term? Whether home schooling, or public/private schooling, these ideas are a concern in the education of our youngsters. There are many parents who would say YES, it does make a difference and helps the child excel later. Others say that 'Slow Schooling' is the way to go - that good ol' fashioned method of letting children basically be children until they just can't any more. And, does a child get more development out of testing, reading, writing, etc at a young age - or moreso from being allowed to play and pretend and create?